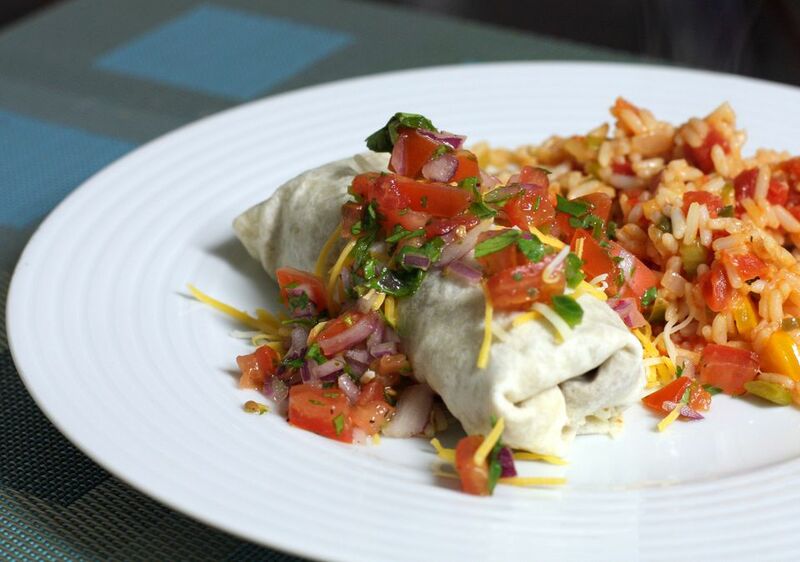 Burritos are a great meal when you are running out of dinner ideas or pressed for time; they come together quickly, are easy to eat, and often a food the whole family will love. These beef and bean burritos are easy to make and quite delicious; the ground beef is cooked along with onion, garlic, and spices, and then combined with refried beans mixed with enchilada sauce. Garnish with shredded lettuce, sour cream, chopped tomatoes, or your favorite burrito topping. Heat the oven to 350 F (180 C). In a large skillet over medium heat, cook ground beef, onion, and garlic until meat is browned and no longer pink, stirring often to break up meat. Drain well. Return to heat and add chili powder, oregano, cumin, salt, and pepper; simmer for 10 minutes. Add refried beans and 1/2 cup of enchilada sauce. Heat thoroughly. Wrap the flour tortillas in foil and place them in the preheated oven; heat for 10 minutes. Spoon about 1/2 cup of the ground beef mixture onto each tortilla; roll tightly and place seam-side down on serving platter lined with shredded lettuce. Spoon the remaining enchilada sauce over tortillas. Garnish and serve with toppings. Whether a last minute dinner, lunch on-the-go, or a filling snack, burritos are the perfect food to grab in a pinch. Besides being easy to make, they also freeze well. Wrap each burrito in foil and put them in a freezer bag. Freeze for up to 3 months. This recipe can easily be doubled to make sure you always have them on hand. To save even more time, you can use pre-packaged taco seasoning instead of the individual spices. Try to buy a reduced sodium variety since the refried beans and enchilada sauce will have a significant amount of sodium. Feel free to add mild chile peppers or jalapenos to the onion and ground beef mixture if you like extra heat. You can also substitute salsa for the enchilada sauce. For a recipe with less fat, swap out the beef for ground turkey meat, and replace the refried beans with canned black or kidney beans. To make this recipe vegetarian, use sliced bell peppers in place of the ground meat and add a bit of Spanish rice if you need a bit more heft. Besides convenience, the beautiful thing about burritos is their versatility—these hand-held meals can be filled with a variety of combinations, from beef and pork to chicken and seafood to vegetables to breakfast ingredients. But you can also give a traditional burrito a tasty twist; for something different, try an easy burrito casserole, a juicy burrito burger, or a chicken and quinoa burrito bowl.